Social sharing is tremendously important for driving traffic. Equally important is keeping track of those social shares to measure engagement, effectiveness and as a way to plan future content. With Logic Hop you can go one step further and track social shares for content personalization. Imagine knowing if a returning user has shared your site, post or photos – Now you can AND personalize their content based on their actions. Enter Callbacks for Monarch by Logic Hop! The action performed. Typically ‘share’, ‘follow’ or ‘media’. The network for which the action was triggered. ‘Facebook’, ‘Twitter’, etc. Image URL when media is shared. ID of the page or post where the button was triggered. Congratulations – You’re can now track social shares! With the Goal set, we can track users who have shared content and use Logic Hop Conditions to personalize content during their visit. A simple Condition would be to check if the Goal has been set. 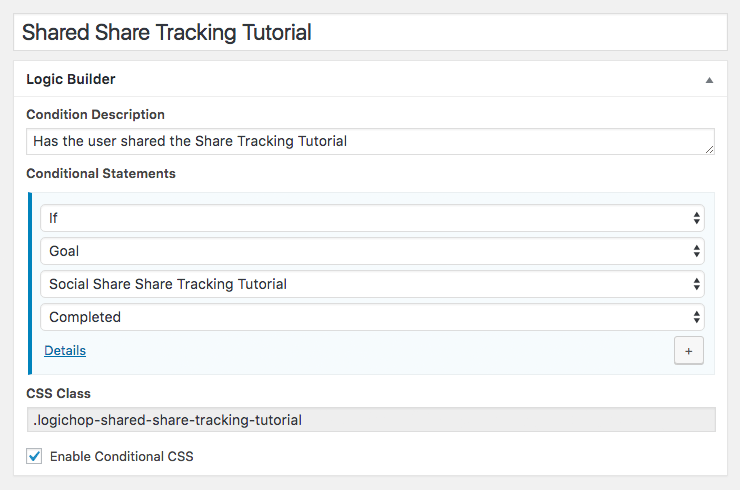 In this example we’ve enabled Conditional CSS allowing us to wrap any content in an HTML element with the class .logichop-shared-share-tracking-tutorial or .logichop-not-shared-share-tracking-tutorial. This first class will display the element if the user has shared this post, the second will display the element if the user has not shared. Note: In the Goal sample, we’re checking for any shared content. For this example, we’ve created a Goal specific for when this tutorial is shared. Boo – You haven’t shared this tutorial! Share it now and reload the page to see content personalization in action. Woo Hoo – You’ve already share this tutorial!